We are replacing our existing systems with new cohesive digital solutions from Digital Technology to achieve current strategic goals and for future expansion of the newspaper. Digital Technology announces an agreement with The Gisborne Herald to implement DTI ContentPublisher and DTI Advertising to enhance the digital efforts of the Gisborne, New Zealand newspaper. 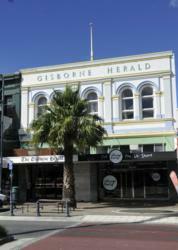 From the city that boasts it’s the first to greet the sun each day, The Gisborne Herald is a leader in New Zealand newspaper production. It was the first daily tabloid on the streets – a record that it kept for more than 10 years. It has been operating a number of older editorial and advertising systems and has not been able to transform into a new digital direction. Digital Technology offers The Gisborne Herald a new business model using DTI ContentPublisher and DTI Advertising to become an audience-first publisher—delivering digital news and advertising content to a more targeted audience, and expanding their channels across a variety of digital formats. With DTI ContentPublisher, The Gisborne Herald will unify their news team and content, and expand their digital offerings by increasing audience engagement to their print, Web, and mobile platforms. DTI ContentPublisher provides The Gisborne editorial team with a flexible way of pushing up-to-the-minute news to the Web, rather than going through a number of manual interventions. DTI ContentPublisher accelerates the flow of content with a high performance, multidimensional database that serves up multimedia content directly to any Web-enabled device. DTI Advertising is a 100% browser-based digital solution for booking, creating, and publishing all forms of digital and print advertising. DTI Advertising also includes an Accounts Receivable package and is architected for multichannel media companies that sell package buys for all types of ads and marketing campaigns, including Web, print, email, direct mail, inserts, and social media.